Delta’s engineering team specializes in process, mechanical, electrical and software disciplines of the steel processing industry and will meet the most demanding challenges. Delta’s engineering team is made up of experienced designers dedicated to the design and technological development of flat-rolled metal-processing equipment. 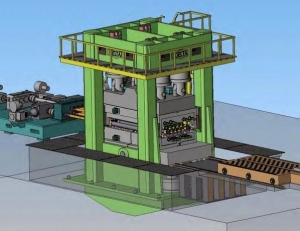 Our design team employs the latest computer aided design software in 2D and 3D to assist our customers in equipment design, plant and equipment layout, material flow and control strategy to achieve efficiency and the highest return on their investments. Additionally, Delta can provide mechanical and electrical engineering solutions for older equipment. By refurbishing, retrofitting, restoring and upgrading your existing equipment, Delta can significantly extend the service life and reduce the maintenance costs of the equipment.